I’m a little late on this week’s blog post because I’ve been too busy doing things and not busy enough writing about them. Tonight, 12 people are going to sit down at my dinner table and take a trip from Flyover Country to Egypt. Then we will flee from slavery there. I’ve been listening to music all day and cooking, and it has been paradise. Cooking is one of the most relaxing things in the world, and little makes me happier than the prospect of cooking for people I like. I will only cook for you if I like you. You can pay me to write for you, but you cannot pay me to cook for you. Some things are not for sale. In the “things for sale” department, however, my most recent Wisconsin Jewish Chronicle story is out in the world. It’s about Amanda Miryam-Khaye Seigel, who grew up in Madison and now lives in New York. She’s this delightful singer/songwriter in her 30s, and she sings in Yiddish. She has this pure soprano voice and the expressive range of a whole theater company. So even if you don’t know a single word of Yiddish, you still have a pretty good idea about what she’s singing. Hard-core Metallica or Nas fans might want to skip it, but if you like show tunes, this will be right up your musical alley. Anyway, back in the “things not for sale” department, here is what my Seder crew will be tucking into so far: halved and roasted Brussels sprouts with some olive oil and Brady Street Sprinkle from The Spice House, carmelized beets tossed in some espresso vinaigrette from Oro, chicken soup with matzah balls, veggie soup with matzah balls (for the vegetarians) gefilte fish, prime rib (which, when I saw how much it cost, thought, “We are eating my children’s inheritance for Seder dinner!”), eggplant parmesan (for the vegetarians), potato kugel, green beans and a salad (made by my wonderful Milwaukee Mom and cousin Carol). Dessert is pignolis, chocolates made by the culinary arts students at Large Midwestern Technical College – those students make the best-tasting homework ever – and fresh fruit. 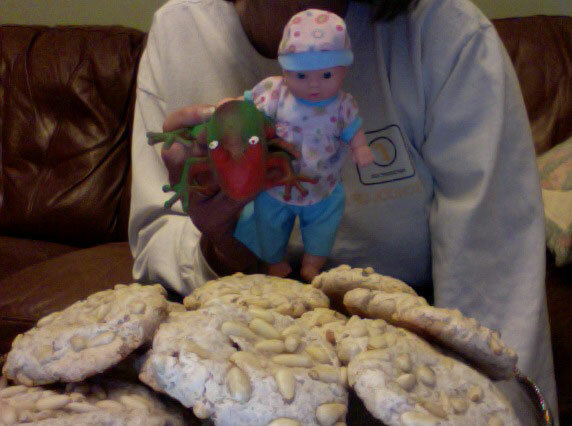 Pignoli, and a couple of plagues. The plagues will be around next year. The pignoli, not so much. I’d like to stick around and tell you about Wednesday night, when my friend Rick, Sweetheart and I went to see Judith Claire Mitchell read from her amazing new book “A Reunion of Ghosts.” She read from the book, but she also gave us a look behind the curtain at the life of Fritz Haber, who synthesized chlorine gas, and his wife Clara, the first woman to get a Ph.D. in science in Germany. Her dreams of doing cutting-edge (or any) research got washed away when she married Fritz. Anyway, it’s time to head back into the kitchen. Those apples and nuts are not going to turn into charoset on their own. Amy, just catching up on your wonderful blog, laughing and crying. Hope it’s a happy, blessed time with family and friends! Awww, thanks, Jeannie! A happy and blessed Easter to all the Walshes! !